Today, we’re introducing you to Lindsay Grosswendt, who together with her family runs Central Coast Family Farm. 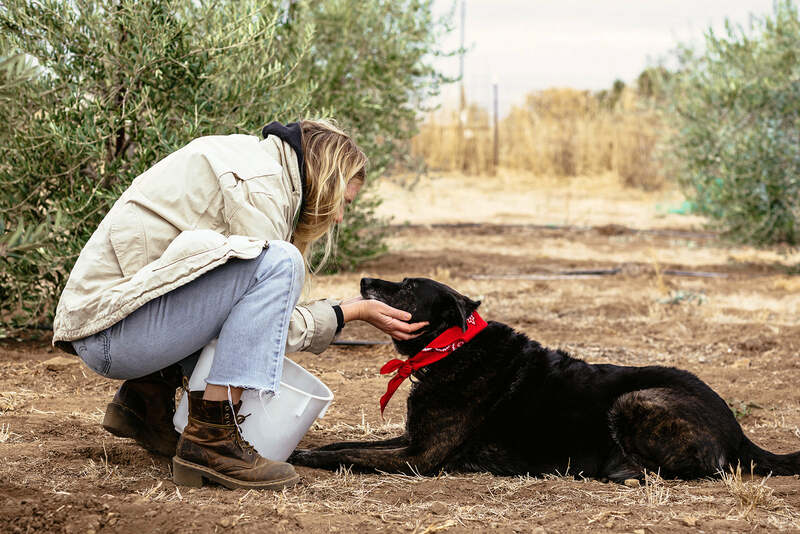 We asked her to share her story of working between the farm and a career in fashion, and how it’s grounded her life in unexpected ways. I work as a freelance stylist in New York City, and the one thing that keeps me sane in the fashion industry is being able to walk away from my day job and get my hands dirty in the soil on my family’s farm. Yes, I run a small extra virgin olive oil company with my family in California, and for now, I can say, I have found balance. In September 2008, when the markets crashed, and so did my mind, I moved from Los Angeles to New York City on a whim. I ran away from confusion in my West Coast life while fashion kept its strong pull and focus for me. Around the same time my parents were just getting settled into their new home: a 4-acre farm in Templeton, California, 3.5 hours north of Los Angeles within the Central Coast. Their purchase of a farm property would soon become one of the greatest gifts they could have given our family. Weirdly enough with me being 3,000 miles away, I have never felt closer to home. Soon after the move, my parents came to me with the idea of starting a family project: growing something we could make on our property for family and friends. Not everyone knows this, but the central coast of California has an ideal climate for olive trees. Plus my mom’s maternal family name happens to be Oliver, so olives naturally fell into place. In the spring of 2012 the olive tree orchard was planted. When this project started, I was living the crazy New York stylist’s life. Back to back jobs with my mind entirely focused on my career’s present and future collaborations. Being that I have always been open and excited for new opportunities and projects ahead, I knew I had the bandwidth to take on both at one time. Being a sucker for all natural face and body products, I made my voice heard that we should definitely grow something that we could use on our body. Pomegranates, Lavender, and Oil were the three contenders. I mentioned I would help out with whatever would be needed on the property as well as come up with a useable product and idea that even I would want to use daily. One thing lead to another, my mom and I on countless calls and video chats regarding bottle availabilities and size, I was able to take it to the next level, developing an image with a design team to make my parents idea come to life. Who knew it would be an actual direct to consumer product years later, and something you don’t only put on your skin, but you use in day-to-day meals. The funny things is too, is that even though we still went with olives, a couple of years later we planted a handful of pomegranates and soon hope to have a beautiful lavender field. Another project in the making? Possibly. But what kept me going for the first 6 years of the trees growing were the positive effects I felt every time I left the farm, that continuously reflected on my career and attitude towards my family, friends and clients. With 420 trees to check and every family member in rotation from time to time when they could to check on the irrigation flow for the trees, and most importantly feeling/observing the leaves to see progression. I can say for myself that when my time was up for a walkthrough I naturally unraveled my issues or problems I was dealing with outside the farm at that time and I became distracted by the care to each tree for the better and naturally left problems in the orchard. Our first harvest was in November 2015, and it became evident upon tasting that we had high quality extra virgin olive oil that we could not just share with family and friends, but also with the world. With a tad bit of persuasion on my end to my folks, I began research and development for the brand…and that’s how Central Coast Family Farm was born. With the perspective I have now, I can say that involving myself in a project other than fashion has been extremely important in so many ways. Being attached to the farm and helping my family has a way of simplifying everything for me; it centers me, especially while working in NYC the majority of the time. My mood, energy, and body feel grounded the more I work with the soil and the project year after year. We’ve all heard that soil in general has positive effects on the human body…those effects you feel are real, and they are very powerful. Through this, I learned that in life we have obligations with our careers, and usually there is no good time, let alone wrong time, to find ourselves involved in something on the side to keep our creative juice flowing… and to stay sane. This project has been a supplement to my styling career, one that has given me a little more compassion, focus, balance, and most of all perspective on my day-to-day life. Till the next time, grow a garden and don’t be afraid to get dirty. For the Holidays, Lindsay is offering all of you a 35% discount on any orders placed through January 1st using the code ATELIER35 at checkout. Thank you Lindsay! Wonderful article. I am wondering if the horrific wildfires have had any effect on your farm. I hope not! Wow! Amazing project, we will recommend the Central Coast FAmily FArm to our customers! Wonderfully written with beautiful pictures. Thank you! Ahh Templeton is pretty close too me! What a cool feature. Will have to seek out their olive oil! I love the article and the beautiful pics. A vision and hard work pay off, monetarily or through the healing of soil.?????? Who makes the hiking boots in the first photo please ? Beautiful post! And yes T, those boots are great! Doc Martens Clemency, maybe? Thanks so much for the tip Enimyou ! These are really lovely pictures. Specially dog is adorable. Love the sunset atmosphere. The vibes in the photo reminds me of my time in Germany’s country side. Lots of love!! !